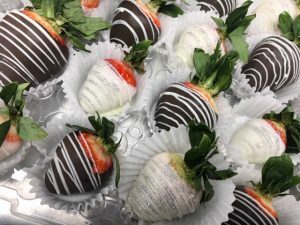 This time of year, we get LOTS of orders for chocolate dipped strawberries. Most are for Valentine’s Day, but this order was for a dessert table at a baby shower. Their accent color was silver, so we stepped up the drizzle on this order. We started by washing and drying the fruit. You want to make sure the strawberries are completely dry before you dip them in the melted chocolate. We then heated the white and dark chocolate in the microwave. 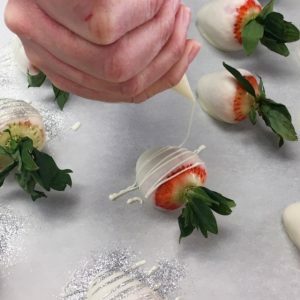 One-by-one, we dip the strawberries and set them on parchment paper to dry. Once the base coat of chocolate has set, we put melted chocolate in a piping bag and cut a tiny hole. We then drizzle the chocolate on the strawberry in a horizontal pattern. If you’re just adding a standard drizzle, that’s the end of the process. 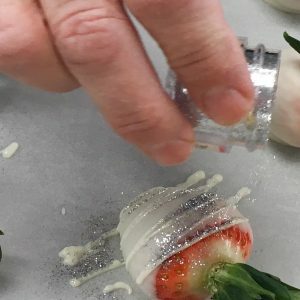 But if you’re wanting to add the silver glitter, you’ll need to drizzle one strawberry at a time and sprinkle the glitter on the drizzle before it has time to set. Once the chocolate drizzle sets with the edible glitter attached, you can brush off the excess glitter with a dry paint brush, so it only sticks to the drizzle. The end result is a glamorous strawberry that will add a little extra sparkile to your dessert table! Once dipped, you should keep your strawberries cool and enjoy them within 2 days. Who’s ready to make some fancy fruit?!? 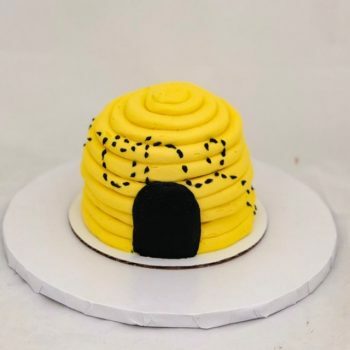 This Could Bee Our Favorite Cake!